LIMITED USE WITH CREDITS! Please note - the reflection map included here is courtesy of Horo (www.horo.ch) and should not be used without his permission. Everything else is my own, and you can do what you like with. This is the final (hopefully!) 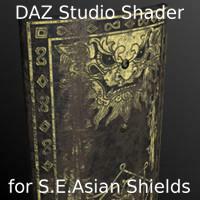 version of my DAZ Studio Triple Material Shader (TMS) for the S.E.Asian shields. Final because using it the shield looks more-or-less as I'd originally planned. There are DUF/DSA materials that can be applied to any of the three S.E.Asian Shields. By default it uses the original mask for the rectangular/narrow shields, so if you want a different design, or if you apply it to the round shield, simply change the mask image (under 'Masks' onthe surfaces tab). *** N.B. LIMITED USE WITH CREDITS! *** Please note - the reflection map included here is courtesy of Horo (www.horo.ch) and should not be used without his permission. Everything else is my own, and you can do what you like with.